Saturn will be in his own sign for the next several years as he passes through Capricorn and Aquarius, granting astrological mages the opportunity to create talismans and craft petitions specific to the kinds of boons that Saturn bestows. Saturn and astrological magic together usually evoke dark and destructive rituals, and it’s true – if you are in the market for a curse talisman, nothing could be easier. Since Saturn is the Great Malefic, it can be difficult to identify positive, constructive blessings that are in Saturn’s jurisdiction. This article presents key attributes of Saturn as seen through one of his Hindu avatars, Lord Shiva, that can be turned into beneficent petitions. Shiva has many Saturnine characteristics, though his significations are far more encompassing than just those of Saturn. It is worthwhile to examine a few facets of Shiva that especially resonate with Saturn, as for all of his fearsome traits, Shiva is fundamentally a beneficent deity, who can give us ways to relate favorably to Saturn. Even those new to astrology are familiar with Saturn in his guise as Father Time. Many astrological attribution lists include “time” as one of Saturn’s attributes, but it’s difficult to know what to do with this information. After all, time is the water we all swim in; it is ever-present in our lives. Among Shiva’s many names is Kala, Time. 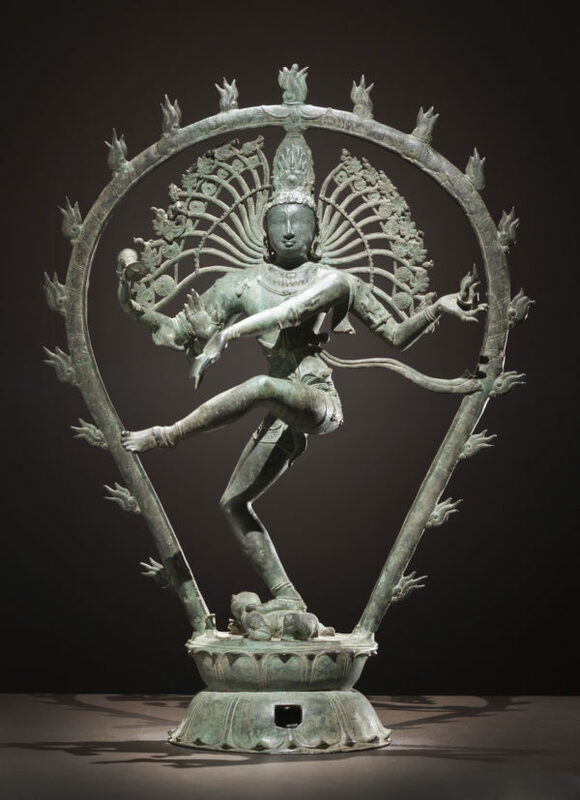 Shiva’s famous avatar Nataraja (literally the Lord of the Dance), beats a finger drum whose rhythms create the cosmos and give rise to time itself. Shiva dances eternally in a circle of fire that cyclically creates and annihilates the universe. Another of his names, Visarga (the Constantly Moving) also evokes time’s relentless motion. More explicitly, he is said to rule over all divisions of time, from the year to the second and the moment. Time is the most fleeting commodity, yet one with the most profound impact on our lives. We cannot make more of it, only reallocate our uses of it. Nor can we stockpile time, the way we can material goods. Yet, in our talismans and petitions, we can ask Saturn to give us the gift of time, the greatest boon of all. We can ask him to grant longevity, or simply more time to do something important, and the opportunity to make good use of the time we are given, however much that may be. Some of Shiva’s names are Kamandhaludhara (the Holder of the Mendicant’s Bowl), Mahapati, Paramayatapa (both names mean the Extremely Austere) and Yogi, as he is the renunciate god frequently portrayed in deep meditation, wearing the topknot and loincloth of the ascetic yogi. Should we wish to adopt a life of simplicity, humility, and renunciation of material things, Saturn can assist in giving up the bonds that tie us to physical existence. More simply, Saturn in astrological magic can help us eliminate those elements in our lives that are manifestations of ignorance and forgetfulness of our divine nature. As Nataraja, Shiva treads on the demon dwarf Forgetfulness, which represents the small, limited perspective as contrasted with the all-encompassing totality of the cosmos. We can ask Saturn to give us an eternal view of our existence, bringing into focus the essential and discarding the trivial. Each of the planets has a characteristic vice; though fear is not one of the seven deadly sins of medieval theology, it is the negative emotion most associated with Saturn. The planets can bring about their assigned conditions, and they can dispel them. Thus, Saturn’s natural tendency to aversion can be turned to our advantage, as we ask him to eliminate fears that limit our full expression. Shiva Nataraja’s lower right hand makes the gesture that allays fear (abhayamudra), and though he is a fear-inspiring god, he reminds us there is nothing to fear, as all existence is cyclical and ever-changing. His long hair fans out around him, suggesting the frenzied dance of creation and destruction, which cannot be arrested and in which the only right action is to dance, unafraid. Saturn will enjoy a particularly auspicious date in December 2018 in which to create an astrological talisman for any of the above gifts. Afflictions to Saturn in 2019 mean that this may be the last opportunity to use Saturn for astrological magic for some time. You can purchase a list of magical election dates here, including extensive information for using each planet’s symbolism in magical rituals.